First up is Nails Inc Royal Botanical gardens, which is a slightly more blue toned shade, and my first (and only) Nails Inc shade. I like the formula, love the colour and can’t wait for bluer skies to wear this even more! Next is my current favourite, Bourjois Amande defile, which means sugared almonds I think! This colour is pretty unique I think, and more green than mint, but also not at the same time… it basically looks like sugared almonds and little sweets on my fingers, a very cute shade! Next is OPI’s Mermaid’s tears, which I’ve had for ages but I still love. A slightly murky pastel green, very pretty. I think this shade would look awesome ombre-d over a mintier shade. Next is Maybelline’s mint for life, which is a pretty true mint shade. Love the brush on this, it’s really wide and covers the whole nail in one swipe. The Maybelline polishes are definitely worth checking out, under a fiver and a very nice formula. Next is the infamous Essie Mint candy apple, which is the shade that kick-started this whole mint obsession over a year ago. Love the colour, it’s the best and this instantly makes me happy! I’m only got 1/3 of the bottle left and it’s started to get a bit gloopy and hard to use, but I still loves it! Onto the next one, well done if you’re still reading! Model’s own Apple pie is a ‘scented’ polish, which is pretty gimicky and a bit rubbish really. This is a nice pale appley colour, but the formula is not the best… streaky and takes ages to dry between coats. Rimmel’s peppermint is one my nails as I type this, and this is more of a tiffany blue colour, rather than a straight up mint. The formula is a nice two-coater on this, and it stays around 4-5 days on me without a chip. Success. Finally we have Topshop’s gone fishing, which is more of a green hue but very nice nonetheless. Topshop polishes are some of my favourites, excellent formula and decent price! 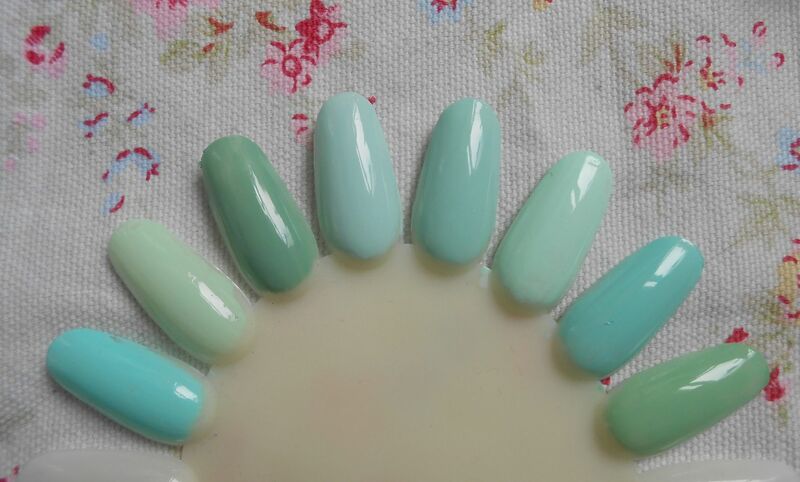 So there we have it, a mini essay all about mint polish! 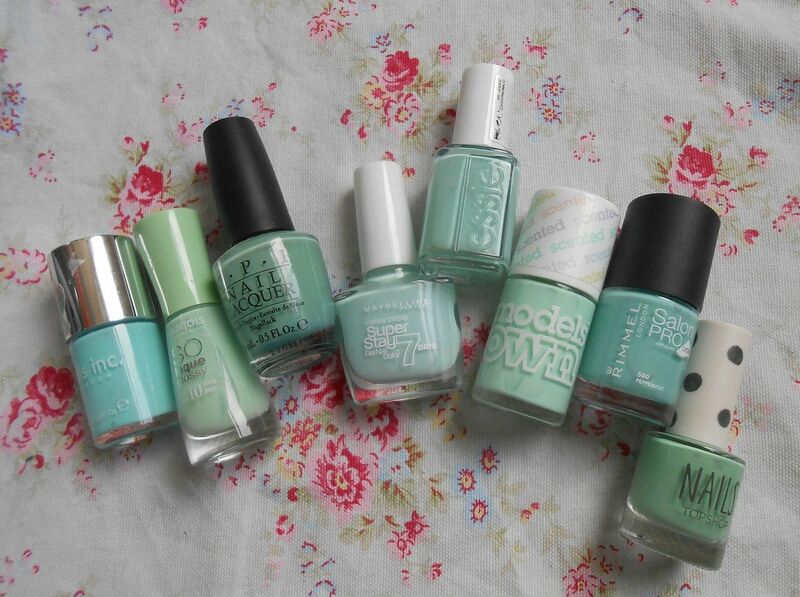 Do you like mint polish?